My team at HVMN and our partners at Oxford University are working very hard to manufacture and deliver an effective, safe, and fully 3rd party batch-tested and validated HVMN Ketone (ΔG® ketone ester) to you. Production is currently in full swing, and I’m happy to announce a target delivery in April 2018. Thank you to the early pioneers who commited in our November 2017 pre-sale. You're a founding contributor to our efforts here, and you'll be first in queue to be fulfilled. To be clear, no one has been charged yet, and we will not charge you until your HVMN Ketone package is in the mail. For those on the bubble, it's not too late to obtain priority when we fulfill in April. Before sharing more detailed production and fulfillment details, I'd like to step back and provide context on the HVMN Ketone initiative. This current production run marks the first time in history that ketone esters are being produced at the metric ton scale. 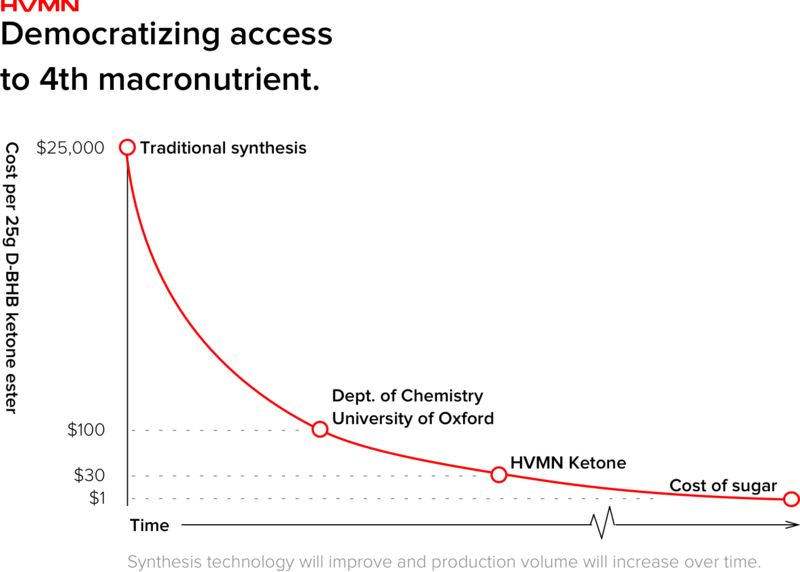 With traditional synthesis techniques, HVMN Ketone would have cost $25,000 and could only be reliably produced at the gram scale. When ΔG® ketone ester was produced in the Oxford Chemistry Department for animal and human studies, new techniques allowed production to reach into the kilogram scale, and costs were reduced to about $100-$200 per drink. The ketone ester that will soon be in your hands is currently being produced in a pharmaceutical-grade facility at the metric ton scale. Those familiar with chemical engineering scale-ups understand that each step-up in efficiency and scale is a tremendous engineering challenge akin to starting from scratch. We hope to continue this scaling process to democratize access to HVMN Ketone, which we consider the first food in a novel fourth food group of edible ketones (joining the pantheon of fats, carbohydrates, proteins). Our production pilots came off the line in December, and the purity and quality control results are the highest we've ever seen. 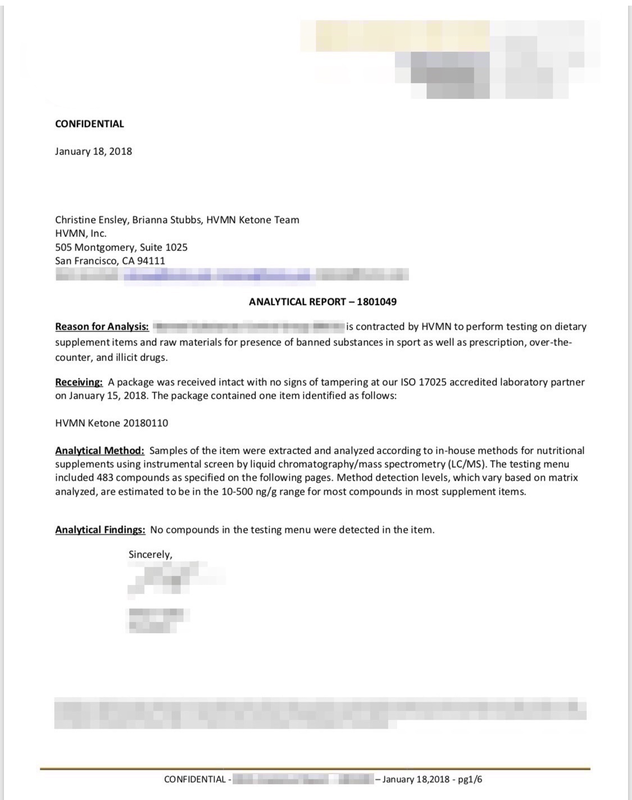 Samples went out to 3rd party labs last week, and it's great to confirm independently that our process is pure and untainted with any potential adulterants or banned substances. While many significant hurdles are now cleared, our team understands that clean execution is still needed between now and April. We are currently underway with extended stability testing. HVMN Ketone is guaranteed to be shelf-stable for 6 months, but we expect this to extend the shelf life as stability testing data comes back. This will allow us to make official label claims that HVMN Ketone will be 100% stable for extended periods of time, whether it's sitting in your pantry shelf or in your rucksack out in the peloton or in the field. In parallel to extended stability testing, HVMN Ketone is undergoing qualification for the NSF Certified for Sport program. This process takes 30+ business days from initial submission. For our athlete customers, this means ease-of-mind when you're competing at the highest levels. For our customers looking for the health and nutritive benefit of ketones, this means 100% confidence you're getting a high-quality, efficacious product. Lastly, all the materials - including bottles, caps, labels and other special goodies - have landed at our facilities over the last couple weeks. Everything is custom, and in fact the bottle itself has a patent pending for its unique design. But it's not just exterior sheen. The cap has a wide mouth and a unique 1.5 turn count for easy access during athletic competition; the bottle material is a 100% recyclable, BPA-free PET; and the artwork has built-in dosing lines to allow advanced users to adjust grams of ketone ester to their own body weight. Sleek, functional, and iconic, the bottle exudes our attention to detail that carries from the surface down to core technologies behind the ketone ester. I can't wait to deliver HVMN Ketone to you. I must admit I pulled one bottle from the pilot batch to give it a try, and it's phenomenal: I went from nominal blood ketones to 4.8 mM in 10 minutes. I want all of you to join me in this experience as soon as possible, and my team and I thank you for your patience as we bring edible ketones into reality.